I’ve made a few too many trips to Friar Tuck’s over the last week or two, and picked up some Peychaud’s bitters, Grande Absente absinthe and Luxardo maraschino liqueur… Great purchases if you ask me! The mini bottle of absinthe was the way to go (pictured in the Sazerac photos) because it was only $12 or so, and so I didn’t have to fork out around $70 for a regular sized bottle. It was a great way to go to since absinthe is so strong, most drinks I’m finding recipes for only call for a splash of it to coat the inside of a glass. So this little bottle will last me a long, long time. But even if it doesn’t, I now know how highly I think of this green elixir, and won’t mind shelling out the big bucks for a big bottle. 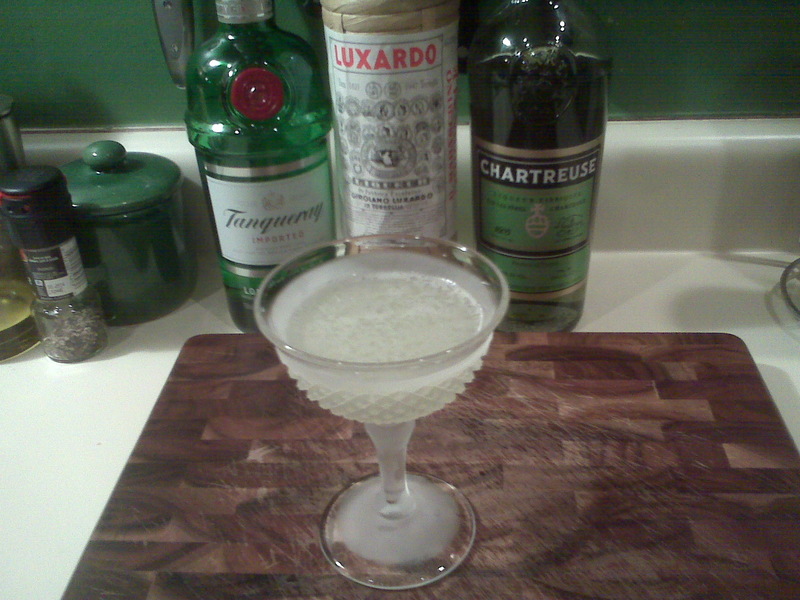 I’d tried absinthe several years ago, but just straight (well, with water and sugar and what not, but still…). At that time, I thought it was just OK. But now, using it in cocktails, I think it’s the tops! Like I said, a little goes a long way, and the anise flavoring of absinthe really lends a cool and refreshing note to any cocktail it’s added to. It makes a whiskey drink seem summery! And that’s something to sing about! 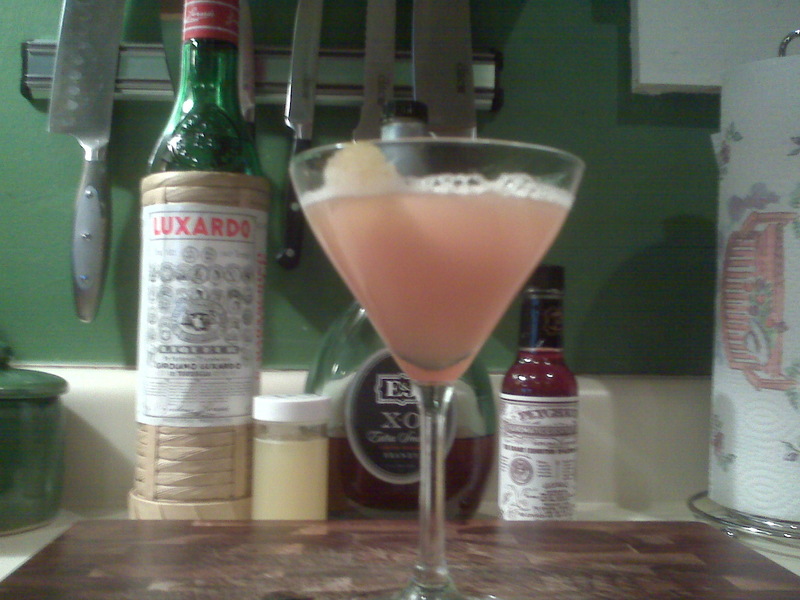 The Peychaud’s bitters was a pre-requisite to buy in order to make the Sazerac. Peychaud’s bitters is from New Orleans and its creator is credited as the creator of the Sazerac cocktail. So, there wasn’t much choice there. But it’s really good too. The Luxardo maraschino liqueur is something I’ve wanted to buy ever since I fell in love with Peter Heering CherryLiqueur (for a photo of Peter Heering, see my blog’s gravatar image… What a guy!). Once I got the Cherry Heering, I started noticing that there weren’t all that many recipes that called for it’s rich, tart flavor, and instead most drink recipes called for maraschino liqueurs, which are made from the Marasca cherries and are lighter and bitter-sweet, and have a note of almond flavor from the crushed cherry pits. 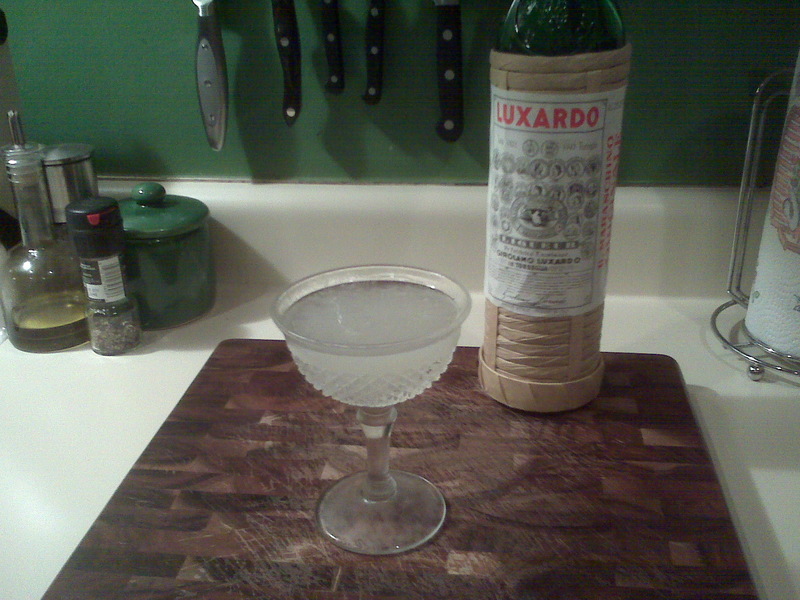 One of the most revered maraschino liqueurs is the Luxardo brand. At first taste, I wasn’t that thrilled because it was quite different from the CherryHeering which I love. But after a few tries and a few different recipes, I’m hooked on it too. It’s typically used in very subtle ways in drinks, and it plays more of a background role, lending a nice support to the ingredients in the forefront. It’s the Steve Buschemi of the cocktail world. In addition to the acquisitions of these new ingredients, I also picked up a great book from the library… “The Craft of the Cocktail” by Dale DeGroff. I already have a great book by Mr. DeGroff, called “Essential Cocktails” which has been featured many times in this blog with recipes pulled from it. This book however, is a nice compliment to that book. I think it came out before “Essential Cocktails” and is more of a “complete and everything” guide to cocktails, from basic explanations and histories of each type of liquor, to a guide to unique measurements, to recommended websites and further reading, to an alphabetical list of tons of cocktail drinks. Where as “Essential Cocktails” is like a greatest hits album which nicely organizes all the best drinks in to their proper categories (Classics, Moderns, Sours, Highballs, etc. ), this book is more like the “Bartender’s Bible” which is almost like a dictionary which lists tons of drinks alphabetically, but has much nicer pictures and descriptions than the “Bartender’s Bible”. Each book is unique to itself and offers a benefit, and so I’d recommend both books if you have the time and money to spend, or a library where you can borrow it for a few weeks. The nice thing is that there are drinks featured in “Essential Cocktails” that aren’t in “The Craft of the Cocktail” and vice versa, and even some drinks that are listed in both have slightly different recipes and therefore you can select which one fits your palate better. Both are top notch books and great resources to have… Reading them is so fun that they inspire me to run to the kitchen to mix one up! That’s why I recommend reading them in the evening time, rather than in the morning before going to work. They can be frustrating if read when you can’t go mix a drink. What a drink! I love it! It’s perfect for when you want the nice, stiff taste of a whiskey drink served up, but it’s hot outside and you need some refreshing thirst quenching. 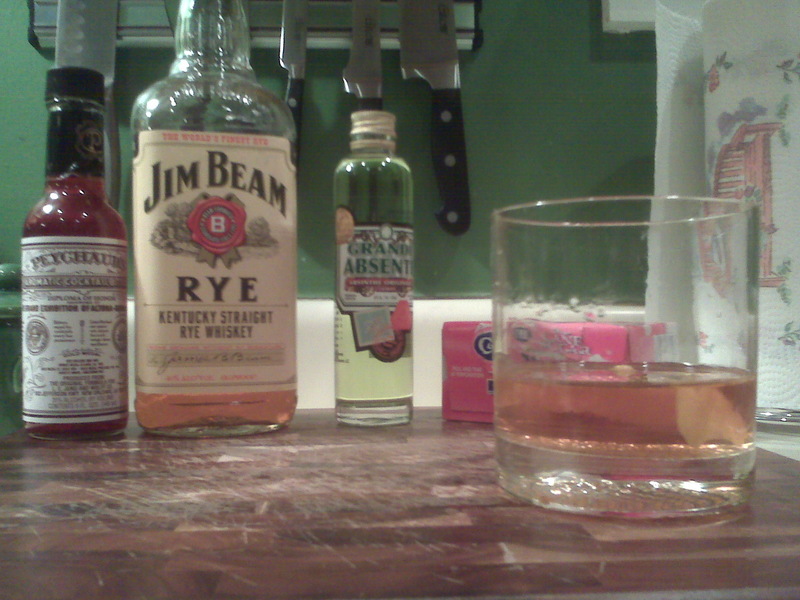 The rye whiskey adds spice, but the lemon and absinthe make it cool and refreshing. Plus the sugar makes it a little sweet. When preparing, you only coat the inside of the glass with absinthe, but it’s surprising how much you can taste the absinthe in the drink. Top notch! Here’s a drink that features Campari, an aperitif bitters made with herbs and fruits. It’s often described as an “acquired taste” due to its bitter taste. I’m still not a huge fan, but this was one drink I did really enjoy. It’s perfect for when you want a refreshing and summery, back porch drink without wanting a “sweet & fruity” drink. All the flavors are very muted. The drink’s refreshing with the gin, orange juice and ginger ale, but it’s dry at the same time because of the Campari. 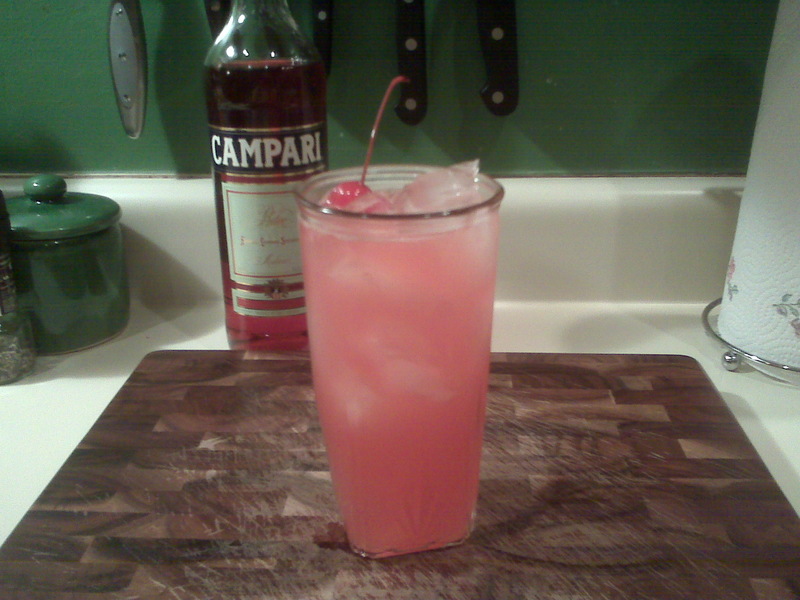 Very good – Campari… you’ve served your purpose in life well. Combine gin, Campari, grenadine and OJ… Shake well and pour in to a collins or a highball glass filled with ice cubes, and top with the ginger ale… Garnish with the cherry. 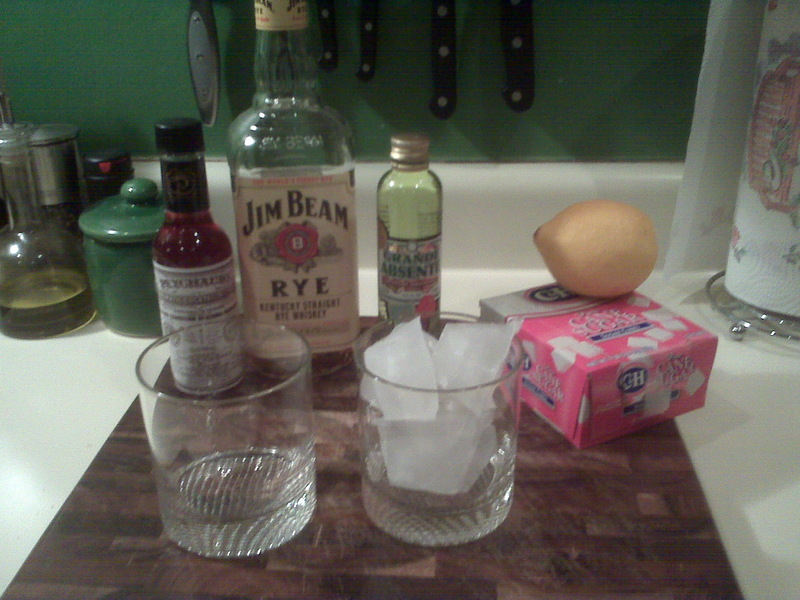 This is a great, simple showcase and use of the maraschino liqueur. Very good drink. It has a very unique, nutty taste that you don’t taste everyday in most cocktails. Great drink! I found it to be very delightful to drink while sitting on the back porch on a lazy Sunday afternoon… Initially, I thought it was a little too heavy on the taste of the brandy. The caramel taste of the brandy surprised me being side-by-side with the maraschino liqueur and the pineapple juice. But by the second glass, I really began to love its unique flavor. It was another refreshing drink that’s not too fruity or sweet. I guess that’s almost the them of this particular blog post… refreshing drinks that aren’t sugary sweet and fruity. 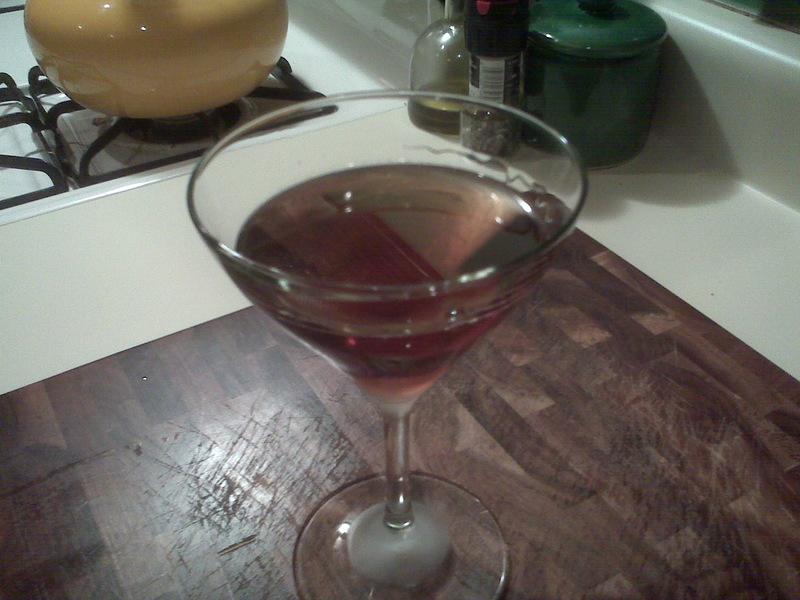 This is an awesome alternate take on the classic Manhattan! This drink’s perfect for when you want a Manhattan, but want a more refreshing drink… The absinthe livens it up a bit, adding a fresh kick. Very good cocktail. The recipe I found said to swirl the absinthe in the glass to coat the inside and then pour out the excess, before adding the remaining ingredients… I was, however, in the mood to have some more absinthe in the drink, so I actually just mixed in about an 1/8 oz of absinthe with the bourbon, sweet vermouth and bitters, and then stirred with ice, leaving all of the absinthe in the actual drink, and then strained in to a chilled cocktail glass. Now that I’ve got my maraschino liqueur, I was able to taste what this drink was supposed to properly taste like. (I’d originally only had Peter Heering Cherry Heering to use, and in one of my previous posts talk about how it didn’t work well and how it actually led to me creating my own variation called “The Counter Argument”.) This classic cocktail was reportedly brought back to life by a bartender in Seattle (Zig Zag Cafe) who disovered it in some old cocktail recipe books. Since it’s re-discovery, it’s enjoying quite a revival in popularity all across the country. It is indeed a good drink. It too has some really unique flavors and the Chartreuse really shines through and takes center stage, with a really nice accompaniment of the maraschino liqueur. I love this concept of buying a small amount of something to try……I think people should apply this to more areas in their life than just drinks. Either way–this helps to achieve trying numerous new coctails……what an innovation! You’re mixing some great drinks here! Try the Aviation with some Creme de violette . . . Rothman and Winter makes a nice bottle. This is the original recipe, and adds a whole new dimension to the drink (http://www.tablematters.com/index.php/bottle-sections/bz/bz4). Look forward to reading more from you! Thanks for the tip! That sounds enticing… What does Creme de Violette taste like? Flowery and somewhat sweet…similar to violet hard candy. Frankly the stuff is too much on its own (much like Maraschino), but works as such a subtle complementary flavor in the Aviation.